Radical Angle | Wavify Inc.
RadStudio is a paradigm shift Digital Broadcast Production solution from Radical Angle. RadStudio is a proposed-built turn key computing appliance for creating a full featured digital broadcast studio environment. RadStudio can be operated with minimum resource and personnel comparing to traditional screen set approach. The system has been specially designed to generate CNN quality broadcast content using proprietary precision robotic vision technologies. 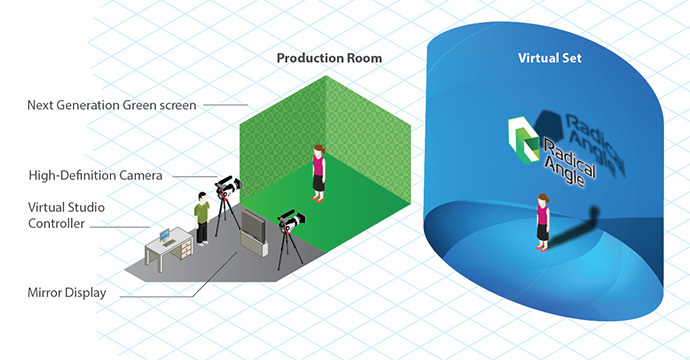 The result content is a real time immersive 3D virtual reality, which has visual quality surpassed the result from physical broadcast system with traditional green screen.